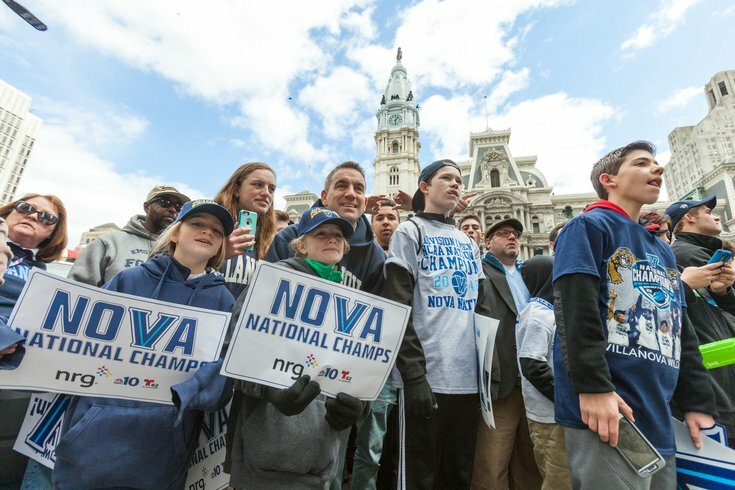 Thousands of Villanova fans came out Friday, April 8, 2016 to cheer on the 2016 men's basketball team. The calendar has flipped to March and that means the NCAA basketball tournament will capture the attention of sports fans and most work offices. That is especially true in Philadelphia, according to a recent study. On Monday, WalletHub, a personal finance website, released a look at the Best & Worst Cities for College Basketball Fans as this year's field of 68 teams is starting to get set. Philly was ranked the fifth best city for hoops fans. Researchers looked at 291 U.S. college towns and crunched the numbers on seven factors, including the number of teams, arena capacity and team success. Unsurprisingly, the City of Brotherly Love was boosted due to the amount of Division 1 squads in the area. The Big 5 teams – La Salle, Penn, Saint Joseph's, Temple and Villanova – as well as Drexel attract a lot of fan interest. Philly has the second-most number of teams in the country, trailing only Los Angeles. Despite Villanova's stellar season atop the AP rankings, the city's overall winning percentage was just average. Penn, Saint Joseph's and Drexel are all below .500. Philly was also hurt by a lack of fan engagement on social media. However, the city offers a plethora of activities, including competition from the four major professional sports teams, that dilutes discussion among residents. Only Chapel Hill, North Carolina; Los Angeles; Durham, North Carolina; and Bloomington, Indiana, were ranked higher on the list than Philly.